This is in honor of my husband Eric. He fought such a brave fight. He taught so many how to live, really live! and he never gave in to the disease, he went on his own terms when he was ready! No treatment was ever too much for him, he faced it all head-on and fought so hard up to the last day of his life. He did clinical trails, and kept right on living until it was the right time for him to let go... I will miss him every minute of every day until we meet again. This tribute is to honor the life of my Mom, Phyllis, who transitioned from this world on Aug 30. She fought this disease with dignity, spiritual fortitude, humor and grace; traits she exhibited her entire life. My Mom was and will always be remarkable. I love you ma and I will miss you. <p>This is a tribute to Creature's first employee and honorary founder, Melissa Peterson.</p><p>My partner, Jim, and I (Matt, her husband) could never have gotten off the ground in 2002 without her (or look like the cool indie rock band that we do in this picture). She helped us set the culture of our company that carries on today. Have fun, be nice and make friends. Don't stress out! It's advertising, for Pete's sake.</p><p>Melissa, we all love you and miss you. Your spirit is undefeatable. You rock, and a big champagne Friday toast to you! At age 8 or 9, I heard a meteor shower was going to be visible after midnight. My Dad woke up at 5 am to commute to work, but he still took me to a park that night. I gazed at the sky for an hour and a half, but didn't see a single meteor. "Have you seen any shooting stars?" my Dad asked. I told a white lie, "Yes, I think I saw one." I didn't want him to think he took time out of his busy schedule for nothing. I'm not sure he believed me. A woman as lovely inside and out such as Martha will never be forgotten. She touched us with her grace, wisdom and humor and will be missed. John Cromwell was my husband and best friend. After his diagnosis in 2007 we had to radically change our dreams of the future. He used the GRACE site to research his disease, and became his own best advocate. We were blessed with wonderful doctors, nurses, and a network of friends and family who helped us cope. John had several good years of stable disease, but in December of 2010 he succumbed. His courage and devotion to our family during those last weeks continues to inspire us and give us comfort. 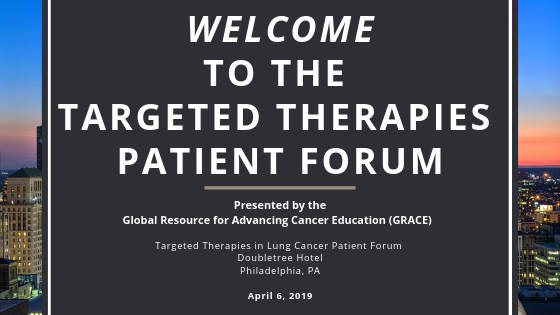 Lisa and I have been long-time participants on GRACE – I discovered it in July, 2008 when my wife Liz was diagnosed with Stage IV lung cancer, became a member and began posting in May, 2009 and added moderator duties in January, 2010. Dr. Chris Loiselle is a radiation oncologist in the radiation oncology group at Swedish Cancer Institute in Seattle. Dr. Thomas Hensing is a Clinical Assistant Professor of Medicine at the University of Chicago Pritzker School of Medicine in Chicago, Illinois. Dr. Hensing is also the Co-Director of the Thoracic Oncology Program for the NorthShore University HealthSystem. Dr. Hensing received his BS in Biology from Loyola University in Maryland. He then received his MD from the University of Maryland School of Medicine. His Internship, Residency, and Fellowship in Oncology were at the University of North Carolina School of Medicine in Chapel Hill, North Carolina.